Grandfather Clocks for sale with the best service at the lowest price allowed by Howard Miller online. Over 63,000 clocks delivered to pleased customers in the last 17 years. 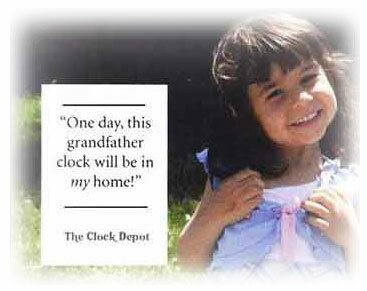 Ask any question about our grandfather clocks or about our nationwide in-home delivery. 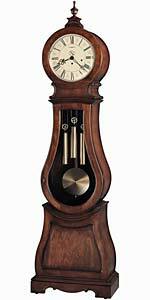 Grandfather Clocks by Howard Miller have been Made in USA by American Craftsman for over 90 years. Grandfather clocks made in USA Click any grandfather clock or Floor Clock image for greater detail, information on any Grandfather Clock. This special 93rd Anniversary Floor Clock is inspired by the Swedish Mora clocks from the late 1800s, and includes an Anniversary Edition inscription on the dial. The aged dial with worn black Roman numerals and minute track and charcoal hands features a special "Anniversary Edition" inscription, all behind a convex glass crystal. The crown on this clock is removable, offering two distinctive looks. Cherry Bordeaux finish on select hardwoods and veneers is lightly distressed. Hinged, top door offers easy access for winding of the clock movement. The dial and case are illuminated, with an easy to reach roller switch on the back. The tapered base features a decorative cutout. High-precision, German-made Kieninger® cable-driven, Westminster chime movement plays 1/4, 1/2, and 3/4 chimes accordingly with full chime and strike on the hour. Automatic nighttime chime shut-off option. Designed and Assembled in the USA. Two Year Warranty and Free Shipping. Influenced by Scandinavian design, this cherry grandfather clock is a unique addition to our Furniture Trend Designs Collection. The curvaceous clock is finished in Tuscany Cherry. This design was originally the first grandfather clocks that were ever made. Convex glass crystal on the hinged top door, decorative carved accents, and a turned urn finial. Aged to match the era, the antiqued dial offers Roman numerals, black serpentine hands, and a separate track for counting seconds. Beveled glass. Cable-driven, Westminster chime Kieninger movement with automatic nighttime chime shut-off option. Two Year Warranty and Free In Home Delivery. The Howard Miller Baldwin 611-200 grandfather clock is a special 87th Anniversary Edition model for 2013. Cherry Bordeaux finish. Brass finished dial with a silver chapter ring with applied brass Arabic numerals, and an astrological blue moon phase. Brass pendulum with matching center disk and weight shells. Swan neck pediment with carved rosettes features book-matched, olive ash burl, a decorative shell overlay and turned finial. Plain glass on the upper door and sides. Illuminated dial and case with a mirrored back. Cable-driven, Westminster chime Kieninger movement 4/4 chimes and hour count. Automatic nighttime chime shut-off option. Special 86th Anniversary Edition grandfather clock with the hemispheres on the moon phase. Pediment features book-matched, crotch figured mahogany overlays and a decorative keystone with a "Prince of Wales" motif. Windsor Cherry finish. Dial features a decorative open center which offers a view of the inner workings of the movement, decorative corner ornaments, a moon arch with an astrological blue moon phase. illuminated dial and glass mirrored back. Locking case and floor levelers. Size: H. 87-3/4" W. 27" D. 16-3/4"
This 77th Anniversary Edition cherry grandfather clock features a delicately curved swan neck pediment which is crowned by a turned finial and decorative shell overlay. The polished brass finished anniversary dial offers elaborate corner spandrels, a center disk with an astrological blue moon phase, a silver chapter ring with applied brass Arabic numerals. Finished in Windsor Cherry. Cabinet is illuminated by a light inside the case. Free heirloom plate will be engraved with your family name and a special date. Cable-driven, Westminster chime Kieninger German Grandfather Clock movement with chime silence option. Size H. 85-1/4" W. 22" D. 12-3/4"
This special 90th Anniversary Edition Floor Clock is Finished in Cherry Bordeaux on select hardwoods and veneers. An elegant swan neck pediment features overlays with book-matched, crotch-figured Walnut with an Anigre border, a turned finial, and a decorative shell ornament. Beveled glass on the lower door and bottom sides. Plain glass on the upper door. A high-precision, German-made, Kieninger® cable-driven, triple chime movement plays choice of Westminster, St. Michael, or Whittington 1/4, 1/2, and 3/4 chimes accordingly with full chime and strike on the hour with an automatic nighttime chime shut-off option. Two year warranty and Free In-Home Delivery. Size: Height 87.75" Width 26" Depth 15.25"
This curvaceous floor clock features decorative overlays and complementing detailed removable crown. Carved leaf design accents are complemented by the heavily carved leaf design in the lower door. The distinctive dial features a crystal-cut center disk. An elaborately detailed vine motif frames the pendulum. The face of the dial is illuminated and also provides a warm glow to the interior of the cabinet, highlighting the pendulum and weight shells. Finished in Embassy Cherry. Adjustable levelers. Cable-driven, Westminster chime Kieninger movement with automatic nighttime chime shut-off lever. This classic Grandfather Clock features a swan neck pediment, and includes a turned finial with a decorative shell overlay. Polished brass dial features elaborate corner spandrels and center disk with a silver chapter ring and brass Arabic numerals. Astrologically correct moon phase dial accents the dial indicates the lunar cycle Crystal-cut, V-grooved glass offers a picture frame view. Finished in Windsor Cherry. Adjustable levelers. Illuminated case. Cable-driven, Westminster chime Kieninger movement with chime silence lever. Size: H. 82-1/2" W. 20-1/4" D. 11-1/4"
Special 82nd Anniversary Limited Edition cherry grandfather clock finished in Cherry Bordeaux features a swan neck pediment with book-matched olive ash burl overlays and three turned urn finials. Brushed satin brass finished dial and a functional moon phase. Multi-tiered carved bombe base. Locking door and Glass mirrored back. Size: H. 90-3/4" W. 27-3/4" D. 17"
This 77th Anniversary Edition floor clock features an arched bonnet pediment. Functional astrological blue moon phase. Reeded columns with turned top and bottom caps add an elegant touch, and the decorative cut-out on the sculpted base completes the picture. Beveled glass gleams on the locking lower door. Finished in Oak Yorkshire and Cabinet is illuminated by a light inside the case. Adjustable levelers under all four corners. Free heirloom plate will be engraved with your family name and a special date. Locking door for added security. Cable-driven, Westminster chime Kieninger movement with chime silence lever. Size: 82-1/4" W: 22" D: 12-3/4"
An heirloom-style floor clock with a distressed finish, designed by Chris Bergelin. A carved shell and leaf design draws the eye up to the arched pediment. The brushed antique brass dial is set off by cast corner and center ornaments, a silver chapter ring with applied brass Arabic numerals, and an astrological blue moon phase dial. Mirroring the dial, the lyre pendulum is finished in brushed antique brass. The brushed antique finish and decorative bands of the weight shells also complement the dial. Size: Height 85" Width 22.25" Depth 12.75"
This floor clock showcases a simple, yet elegant design. The dial features a polished brass finished bezel with an elaborate center disk and includes a silver chapter ring with applied brass Roman numerals and black serpentine hands. Finished in a Cherry Bordeaux finish. Glass mirrored back. Cable-driven, Westminster chime Kieninger movement plays 1/4, 1/2, and 3/4 chimes accordingly with full chime and strike on the hour. Automatic nighttime chime shut-off option. Four floor levelers the cabinet on any surface. Two year warranty and Free Shipping. Windsor Cherry finish. Swan neck pediment and shell overlay at base of turned finial. Polished and brushed brass dial offers ornate corner spandrels and center disc w/stationary blue moon phase. Substantially turned and reeded columns accent each side. Polished brass pendulum and weights seen behind glass panels. Chain-driven, Westminster chime Kieninger movement w/silence option. 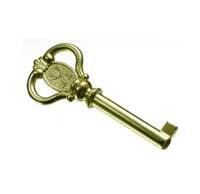 Locking door and free engraved brass plate.